Central Unviersity of Technology‘s (CUT) newly structured undergraduate art programme will have and Advanced and Postgraduate Diploma as well as a Master’s Degree to join the cohort of demand driven user-oriented programmes offered at CUT. Prof. Frances van Schalkwyk, Director for the Department of Design and Studio Art, and Professor for Photography at Maryland Institute College of Art (MICA), in Baltimore Maryland (USA), Prof. Colette Veasey-Cullors who visited Central University of Technology, Free State(CUT) in July and August. During her stay, she consulted on the development of a new curriculum for the Advanced and Postgraduate Diploma’s and the Master’s Degree. The new structure will follow the recently implemented undergraduate qualification, a Diploma in Design and Studio Art, which is South Africa’s first undergraduate interdisciplinary qualification incorporating clothing, fashion, fine art, graphic design, photography as well as jewellery design and manufacturing. In addition to the curriculum development, Prof. Veasey-Cullors also administered classroom development workshops for students, as well as, staff mentorship. Ms Tary Cohn of Art Source South Africa also served as a consultant with the new curriculum development. Image: Proffs. 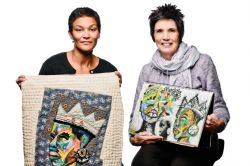 van Schalkwyk and Veasey-Cullors show off their art work.